Sorry I've been MIA for a while, but I've been job-searching and helping my cousin/house-mate paint the house (FYI, not as fun as first thought). Okay, then. Some of you might have noticed already, but I'm attempting to update the site a bit. The Header, Banner and Avatar are all already done, and I should be able to get the Cast page up to date. If the site goes down for a while, it's because I've found the self-destruct button. Seriously. Okay, so I may get booed a little for this one, but hey, it's the best of a bad lot. Lara Croft (Angelina Jolie) must save the world from, first the Illuminati, then the Chinese, often while wearing very little clothing. Movie Executive 1: So we need a big summer blockbuster. Ideas? Movie Executive 2: We haven't ruined any childhoods lately. Let's do a movie adaptation of *draws out of a hat of video game titles* Tomb Raider. ME1: Good, good. Keep it coming. ME2: Sooo... random woman saves the world, yada yada yada. Cliche'd villain, end credits. ME1: I like it. But the nerds will rage and then walk out of the cinema when they realize what we've done with their beloved franchise. Janitor: Put Angelina Jolie in it. ME1: Give that man a promotion! What, you think I'm kidding? I'm not. It's like they just decided to put as much eye-candy in the movie and hoped it would destract people from the gaping holes in the plot. Y'know what, I'm not quite sure. Something about a supersoldier serum and some marines who get sent to investigate when stuff happens. Because they tried to make a movie about a First Person Shooter Game that has no discernable story line to begin with. Yes, The Rock. Now known as Dwayne Johnson. Really, this was one of those movies that was going to shoot him to stardom. And then it didn't. He was nominated for Worst Actor at the Razzies (The Golden Rasberries. Yes, that's a real thing.). My other issue with this movie is that it really just throws in as many monsters as it can. Zombies, aliens and (apparrently) demons. It's like they realised how shoddy the movie was turning out and then just went with the 'kitchen sink' approach. Basically there's no coherency whatsoever. Then midway through the movie she gets them back again. Oh, and did I mention that the guys gets killed, but then comes back later on in the movie for some asinine reason? No? Well aparrently he's a zombie, but not really. Following this? I didn't think so. Admittedly, this movie is one of my guilty pleasures, but it's still a terrible, terrible movie. Max is obsessed with finding out who killed his wife and child. Shenanigans ensue. Because the movie couldn't make up its mind as to what genre of movie it was. It starts out Noir, moves on to Crime, then to Action, then ends up somewhere between Psychological Thriller and Horror. And it's all because of drugs. Remember kids, Don't do drugs. Well that depends on whether or not you can follow what's happening. If you can 10/10. If you can't... well then it shouldn't even be on the list. Okay, I'm not even messing with you here. There is no plot I can even portray here that will make you understand how ludicrous this movie is. Peach plays no part in this movie. This is Daisy. Yes, THAT Daisy. 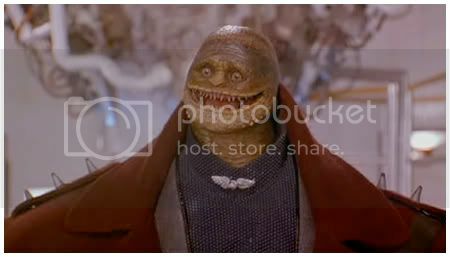 This is apparrently what a Goombah actually looks like. This is Yoshi. I'm not even kidding. The guy in the middle is supposed to be Bowser. Seriously. I think the thing on the right is meant to be a Koopah Trooper? Oh yeah, and the gun? It's a De-Volution ray. It makes you devolve. This is about the expression on my face at the moment as well. On a scale of one to ten? Yes. Hello all, I'm currently procrastinating and avoiding studying for a Statistics Exam on Monday so I've been reading the past comics and saw a complaint about the subscription button being hard to find (The one for ComicFury members, not the RSS feed). I've tweaked the navigation bar so it now includes it. Many, many ways. For starters, it had Gambit in it, who, along with Deadpool, was one of the most requested characters from the X-Men mythos for the next movie after X3. Secondly, it had Deadpool in it. 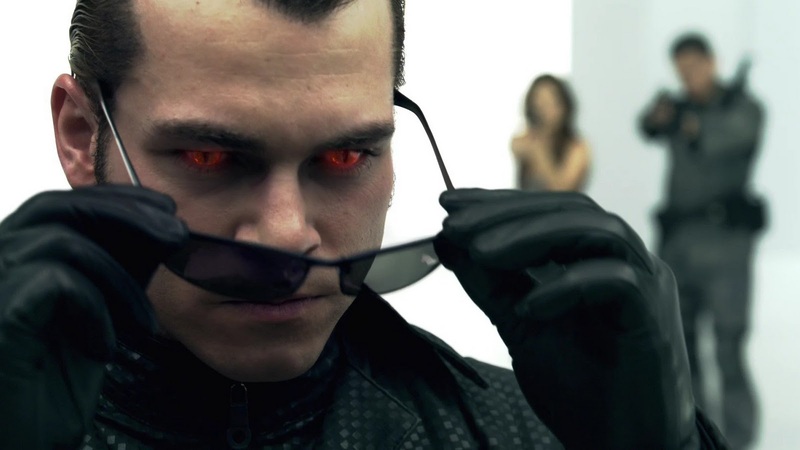 Oh, yeah, and it had cameos from Emma Frost, Cyclops, etc, etc. 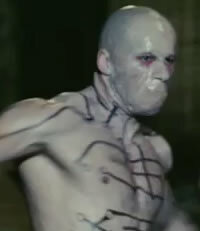 Plus it actually had a proper actor playing Sabretooth, as opposed to his_previous_appearance. That is, the adequately named, Tyler Mane. It was going to be awesomeness of epic proportions. This is a man who laughs in the face of danger; who describes himself as (no joke) a cross between a Shar Pei and Ryan Reynolds. He is insane, uses both a sword and a gun at the same time, and has fought along sides people such as Spiderman, The Punisher, and the X-Men. They turned Galactus into a cloud. No, seriously. They made him into a giant cloud that sort of looked like it might have had a shadow on it that may have been cast by someone wearing a shoddy, home-made Galactus costume, but only if you squinted and were kind of drunk. Damnit, Marvel, stop making crappy comic book movies. It was Hellblazer, damnit! 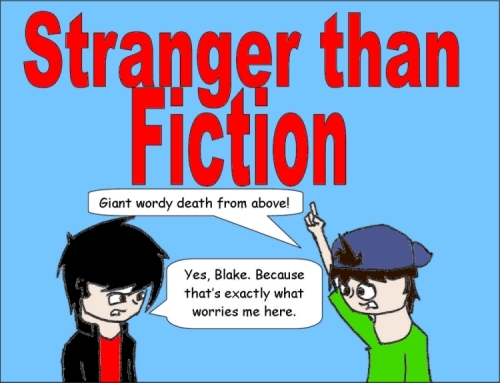 This comic was the epitomy of what an Indie comic should have been like. It stuck it to the two main comic book companies. Even when Vertigo got taken over by DC, it still had some semblance of respect. And, actually, the movie did a fairly good job of conveying the awesomeness of the comics. The man fights demons. The devil brings him back to life because he doesn't want Heaven to have him. This is awesome! Okay, look, in the comics, John Constantine is a wise-cracking, chain smoking paranormal detective. So for cryin' out loud, DC, get someone with more than two facial expressions to play him! It was George Lucas' return to the Star Wars universe! We actually got to see Yoda and Obi Wan in action! Anakin Skywalker as a kid! Okay, seriously, if you were a fan of the Star Wars trilogy back when they were first released (late seventies to early eighties. Before my time, but work with me here, I know what I'm talking about), the Jedi were the epitome of cool. They had cool laser swords and freaking magic powers. The Force was every fanboy's dream. It led many children of the 80s and 90s to try to kill their teachers with their minds (Okay, that one was speaking from experience, but I digress). So it was a huge thing for George Lucas to release a prequel trilogy. Huge. So many a fan lined up for hours, in the rain, waiting to see how the story begins. Only to have their dreams shattered. By Midiclorians. With one line, the Force goes from being mystical and cool, to being a magical parasite. You'll notice that they are never mentioned again in anything. Except for forums of nerds raging about how it should never have happened. Oh, and also, giant frogs. It's Will Smith fighting vampires in a post-apocalyptic New York City. If that isn't awesome to you, you either have no soul, or are a vampire. 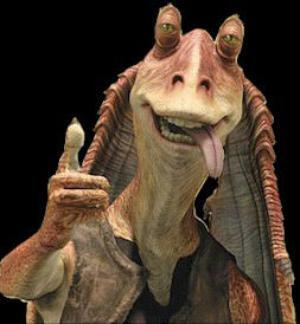 DAMNIT, JAR JAR, GET OUt OF MY BLOG! People thought the original ending was too depressing. The original ending for I Am Legend (based on the book of the same name) had Smith's character discover that the vampire-creature things were only after him because he was capturing and experimenting on them to try to find a cure. A process that, I imagine, would be incredibly painful. However, the entire point of the title is that he is their boogeyman; the legend in their ghost stories. So they changed the ending, completely disregarding the fact that it changed the entire meaning of the title, which was the entire. Freaking. Point. And then they killed the dog.